Seychelles Foreign Affairs Minister Jean Paul Adam (first row second from left) in group photo at the meeting on maritime security and the ocean economy in Mauritius. (Seychelles News Agency) - Seychelles and Australia have indicated their willingness to partner up in their efforts to harness the potential of the Indian Ocean. 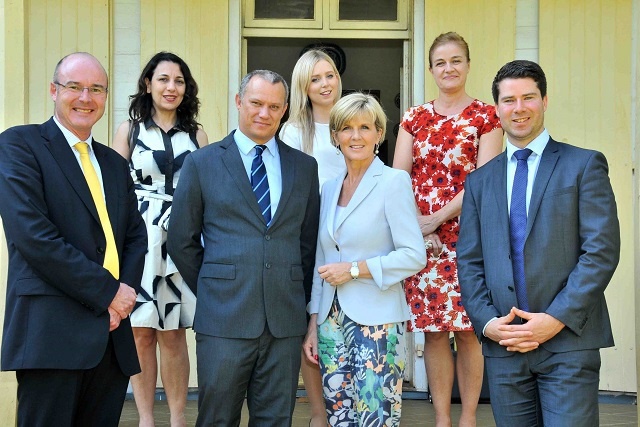 Seychelles’ Foreign Minister, Jean-Paul Adam, was invited to join a high-level dialogue on maritime security and the ocean economy in Mauritius, attended by the Mauritian Minister of Foreign Affairs, Regional Integration and International Trade, Arvin Boolell and their Australian counterpart, Julie Bishop. According to a press statement from the Seychelles Ministry of Foreign Affairs (MFA), Seychelles and Australia have identified numerous opportunities for bilateral cooperation in ocean resource management, otherwise known as the ‘blue economy’, which includes fisheries, climate change, hydrocarbons, maritime lanes and all other oceanic resources. The concept was officially adopted by the 22nd Ordinary session of the African Union’s heads of state and government held in Addis Ababa this year. According to the Chairperson of the African Union, Dr. Nkosazana Dhlamini-Zuma, who visited Seychelles in June last year to discuss the concept with President James Michel, the blue economy will form a major chapter in Agenda2063 which is the continent’s development blueprint for the next 50 years. Bishop is making official visits to South Africa, Mauritius and Madagascar before she hosts the Indian Ocean Rim Assosciation (IORA)’s meeting of foreign ministers in Perth on October 9th. The main focus of her tour will be to champion mining, resource exploitation and women’s empowerment, according to Australia’s Sky News. Australia currently has 134 mining projects in South Africa, as well as a number of projects in Madagascar. The Australian foreign minister has placed great emphasis on the potential economic opportunity presented by hydrocarbon exploration in the Seychelles’ archipelago’s extensive Exclusive Economic Zone (EEZ), which spans 1,374,000 km². Despite the as-yet undiscovered oil reserves said to be lying deep under the Seychelles’ EEZ which Perth-based oil exploration company WHL and several other companies are already working hard to uncover, Australia is developing technology to harvest renewable energy from the ocean’s waves, which according to MFA, is of great interest to Seychelles. The small island developing state is currently a net importer of diesel oil that provides the islands with most of its energy requirements and finding more cost-effective renewable energy technologies are a top priority for the Seychelles. The islands have wind farm turbines which currently generate 2.2 percent of its consumable energy and have developed mechanisms to encourage the adoption of solar energy photovoltaic panels in homes and businesses. IORA’s twenty member states, including Australia, Seychelles and Mauritius, have now identified six priority areas: maritime security, trade and investment; fisheries management; disaster risk reduction and relief management; academic and science cooperation; and tourism. Bishop noted that Seychelles and Mauritius had been “instrumental” in raising awareness of the importance of the world’s oceans. The Australian foreign minister also reaffirmed Australia’s commitment to help preserve the Indian Ocean and also IORA’s commitment to the peaceful, productive and sustainable use of the Indian Ocean and its resources. Mauritian Minister Boolell said that “citizens of the ocean” needed “reliable friends” to take them forward and that Seychelles and Mauritius had shown a great example of this type of partnership by agreeing to co-manage an extended continental shelf area of 396,000 km². In March 2009 Seychelles and Mauritius made a submission to the United Nations for the shared management of the Mascareignes plateau region. The submission was adopted by the UN in March 2011, and the two countries signed treaties for the management of the area in March 2012. “The ocean should be treated as space for exploration, development and opportunities,” said Minister Adam, emphasising that partnerships with countries such as Australia were necessary in order to develop better technology and invest in new research ideas. Despite the opportunities for exploration and exploitation, Adam also cautioned against unsustainable activities, emphasising the need for guardianship of the oceans for the benefit of the entire world.